McKee's 37 Marine & RV All Purpose Surface Cleaner is powerful and versatile citrus-based cleaner tough enough for any job in or around your boat or RV. This concentrated formula can be diluted up to 1:20 depending on the job at hand making ideal for everything from vinyl covers, tires, wheels, non-skid decking and more! McKee's 37 Marine & RV All Purpose Surface Cleaner is the cleaner you need to have in your boat or RV. • Safe for use virtually anywhere: vinyl covers, tires, wheels, non-skid surfaces, and more! • One bottle makes several gallons of ready-to-use APC! Boat and RVs are great places to spend your spare time having fun on the open water or the open road. Whether your boat or RV sees use every weekend or you're taking it out for the first time this season, you're going to need to clean a few things! 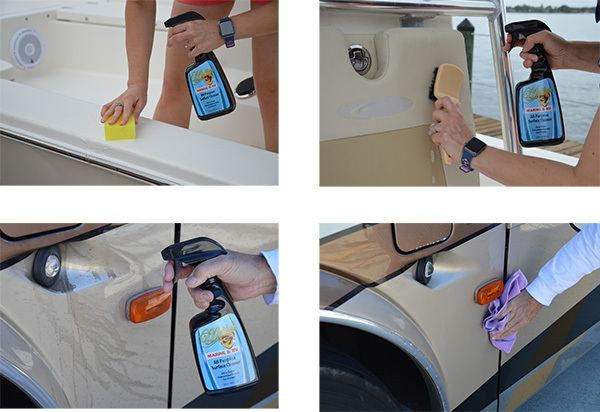 Just like your vehicle, there are tons of unique surfaces in and around your boat or RV too, and that can make choosing the right products a challenge. Or at least it used to! McKee's 37 Marine & RV All Purpose Surface Cleaner makes cleaning your boat or RV easier than ever before. McKee's 37 Marine & RV All Purpose Surface Cleaner is safe on most surfaces, though it's always best to test it in an incenses area prior to use. Use it a full strength for heavy-duty cleaning, or dilute one (1) part concentrate to ten (10) parts water for moderate cleaning. For all-purpose cleaning, dilute one (1) part concentrate to twenty (20) parts water. Do not use full strength on glass, paint, plastic, or vinyl. McKee's 37 Marine & RV All Purpose Surface Cleaner is the eco-friendly way to keep your boat and RV clean. McKee's 37 Marine & RV All Purpose Surface Cleaner is ultra-concentrated for a truly versatile cleaner! 1. Spray cleaner directly onto material and agitate using appropriate towel or brush. 2. Wipe or rinse away residue. McKee's 37 Marine & RV Mildew RemoverMcKee’s 37 Marine & RV Mildew Protectant SprayMcKee’s 37 Marine & RV Water-Resistant Vinyl ProtectantMcKee’s 37 Marine & RV Gloss Enhancing Final PolishMcKee's 37 Marine & RV Hydro Pearl Sio2 CoatingMcKee's 37 Marine & RV Final Step Detail WaxMcKee's 37 Marine & RV All-In-One Fabric & Vinyl CleanerMcKee's 37 Marine & RV Carnauba Wash & WaxMcKee’s 37 Marine & RV Heavy Duty Cleaner WaxMcKee’s 37 Marine & RV Repel Glass & Plastic CleanerMcKee’s 37 Marine & RV All Purpose Surface CleanerMcKee’s 37 Marine & RV Bug Remover & Wax RestorerMcKee’s 37 Marine & RV Vinyl Decal & Graphic RestorerMcKee’s 37 Marine & RV Heavy Cut Oxidation RemoverMcKee’s 37 Marine & RV Carnauba Sealant WaxMcKee’s 37 Marine & RV One-Step Polish & SealantMcKee’s 37 Marine & RV Repel Glass & Plastic Cleaner 128 oz.McKee's 37 Marine & RV Final Step Detail Wax 128 oz.McKee's 37 Marine & RV Carnauba Wash & Wax 128 oz.McKee’s 37 Marine & RV Bug Remover & Wax Restorer 128 oz.